And so the blog lives. Save Maumee is a grassroots, 100% volunteer organization that originated in Fort Wayne, Indiana around the year 2001. King had just purchased a home near the Maumee River and quickly discovered that our rivers were contaminated. “When I asked people what they were contaminated with, no one even knew” says King. So she did exactly what we advocate at Contagious Community and became an agent for positive change. Save Maumee continues to thrive and promote activism, awareness, and (albeit quasi-political) to lobby for legal intervention into the safety and sustainability of our water sources. Now here comes the FUN PART! 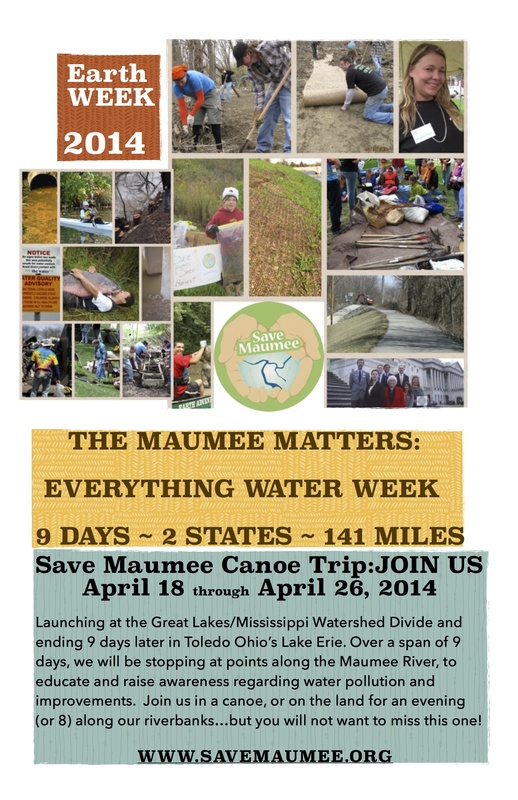 Save Maumee is hosting a canoe/camping trip during Earth Week this year. The trek begins April 18th and runs through the 26th. Per the event flier, the goal of the canoe trip is “to educate and raise awareness regarding water pollution and improvements”. Participants are invited to join for as few or as many days as their schedule and camping-tolerance-level allow. Think of it like a pub crawl through nature, but instead of locating the perfect draft beer the pursuit is on for clean water. Anyone can participate. Visit http://www.savemaumee.org to find out more. My eight-days-a-week mom schedule won’t allow me to ride along this year, but I plan to be at the sendoff on April 18th. Maybe I’ll even spring for some trail mix for the canoers (vegan on this particular day by request of the organization). It’s the least I can do in exchange for clean water.